Dugganite: Mineral information, data and localities. Named in 1978 in honor of Marjorie Duggan [February 18, 1927 New York, New York, USA - April 9, 2002 Tucson, Arizona, USA], analytical chemist for the Phelps Dodge mining company. Duggan discovered the first existence of Te6+ in Nature. Xocomecatlite 3 photos of Dugganite associated with Xocomecatlite on mindat.org. Khinite-3T 2 photos of Dugganite associated with Khinite-3T on mindat.org. Eurekadumpite 2 photos of Dugganite associated with Eurekadumpite on mindat.org. Quetzalcoatlite 1 photo of Dugganite associated with Quetzalcoatlite on mindat.org. Yafsoanite 1 photo of Dugganite associated with Yafsoanite on mindat.org. 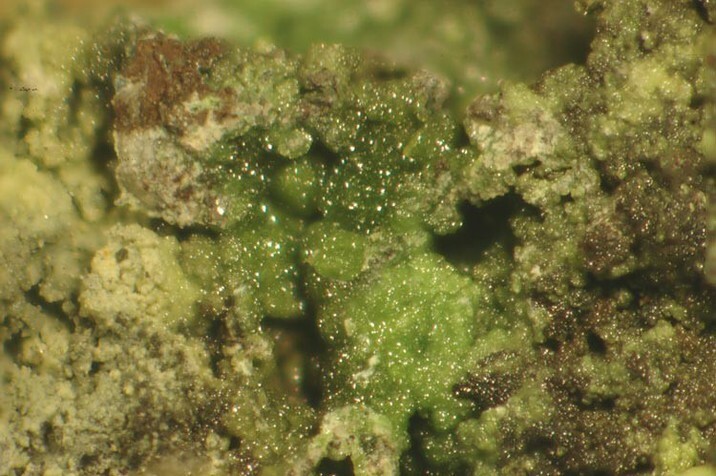 Chlorargyrite 1 photo of Dugganite associated with Chlorargyrite on mindat.org. Khinite 1 photo of Dugganite associated with Khinite on mindat.org. Gold 1 photo of Dugganite associated with Gold on mindat.org. Wulfenite 1 photo of Dugganite associated with Wulfenite on mindat.org. Mcalpineite 1 photo of Dugganite associated with Mcalpineite on mindat.org. 8.DL.15 Zálesíite CaCu6(AsO4)2(AsO3OH)(OH)6 · 3H2O Hex. Williams, S.A. (1978): Khinite, parakhinite, and dugganite, three new tellurates from Tombstone, AZ. American Mineralogist: 63: 1016-1019. Lam, A.E., L.A. Groat, and T.S. Ercit (1998): The crystal structure of dugganite, Pb3Zn3Te6+As2O14. 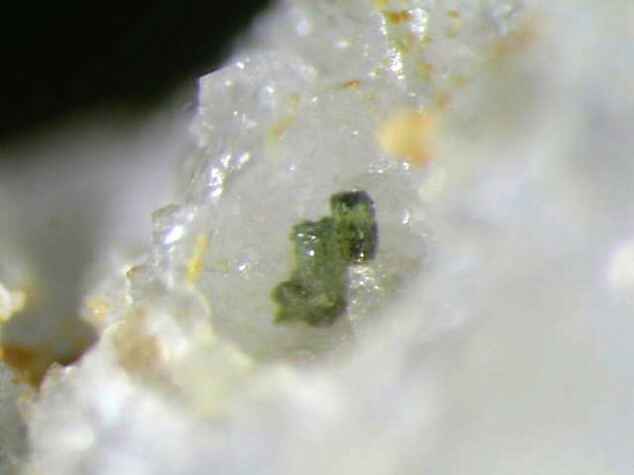 Canadian Mineralogist: 36: 823-830. "The Accidental Pocket" talk presented by Robert E. Walstrom at 2012 NCMA meeting. Anthony, J.W., et al (1995), Mineralogy of Arizona, 3rd.ed. : 209. Anthony, J.W., et al (1995), Mineralogy of Arizona, 3rd.ed. : 209; Williams, S.A. (1978), Khinite, parakhinite and dugganite, three new tellurates from Tombstone, AZ, Am.Min. : 63: 1016-1019. John Hangstrom specimen. EDS analyzed by Bob Housley. S. J. Mills, L. A. Groat and U. Kolitsch (2008): Te, Sb and W mineralization at the Black Pine mine, Montana. Poster, 18th Annual V. M. Goldschmidt Conference, Vancouver, Canada, July 13-18, 2008; abstract in Geochim. Cosmochim. Acta 72, Special Supplement 12S, A632. 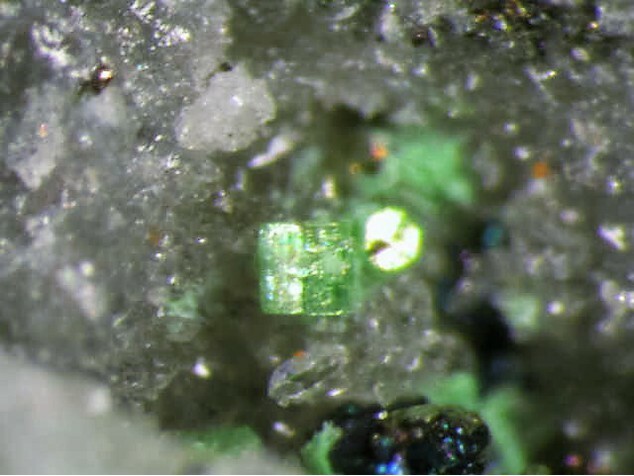 ; Mills, S. J., Kampf, A. R., Kolitsch, U., Housley, R. M. & Raudsepp, M. (2010) The crystal chemistry and crystal structure of kuksite, Pb3Zn3Te6+P2O14, and a note on the crystal structure of yafsoanite, (Ca,Pb)3Zn(TeO6)2. American Mineralogist, 95(7), 933–938. ; Gobla, M. J. (2012) Montana Mineral Locality Index. Rocks and Minerals 87:208-240. Collected by and in the collection of Brent Thorne and Joe Marty. SEM EDS confirmed by Rob Bowell.